Taurus is solid, practical and extremely determined with a strength of will no one can match. No one can ever drive them to do something, but they will willingly and loyally follow a leader they trust. They are stable, balanced, conservative, good, law-abiding citizens and lovers of peace, possessing the common touch. A strong sense of material values and physical possessions, gives this sign a great respect for property and a horror of falling into debt. Taurus will do everything in their power to maintain the security of the status quo and be somewhat hostile to change. This sign is sharp-witted and practical more often than intellectual, but it's possible for them to become fixed in their opinions because of their preference for following accepted, reliable and familiar experiences. The Taurus character is generally dependable, steadfast, prudent, just, firm and unshaken in the face of difficulties. Their vices result from their virtues they often go to extremes on occasion, sometimes being too slavish to the principles they admire. Be careful because on rare occasions a Taurus may be obstinate and exasperate others by being self-righteous, unoriginal, rigid, ultraconservative, argumentative, querulous bores, stuck in a self-centered rut. It's also possible for this sign to develop a brooding resentment by nursing a series of perceived injuries and, whether their characters are positive or negative, they need someone to stroke their egos with a frequent, "Well done." Thankfully, most Taurus' are not this extreme! Taurus is faithful and generous as friends with a great capacity for affection. They rarely make friends with anyone outside their social rank and are excessively faithful to those they do befriend. In the main, they are gentle, even tempered, good-natured as well as modest and slow to anger. Taurus dislikes quarreling and assiduously avoids ill-feeling. If they are provoked, they can explode into violent outbursts of ferocious anger in which they seem to lose all self-control. Equally unexpected are their occasional ventures into humor and displays of fun. 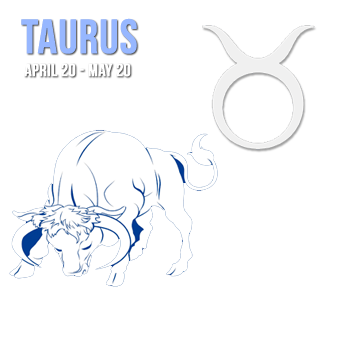 The main objective in leading life as a Taurus is primarily through maintaining stability and physical concerns. The inner spiritual sense longs for earthly harmony and wholesomeness. When fully understood and by working toward that end, there will no longer be a need to blindly be reassured with external possessions and comforts. A realization that finding this inner peace will cause all of the positive things to overtake the, Taurus' life will then be very full.